Guatemala, 1989 tourist visa and livin the life! I borrowed a friends Volvo (do not read “oh wow Volvo” – read ” 450,000 mile beater” and set off to see Central America. I am flogging this Volvo 4 cylinder for all its’ worth heading up a mountain to cross over into Santiago Atitlan. The views are stunning ! 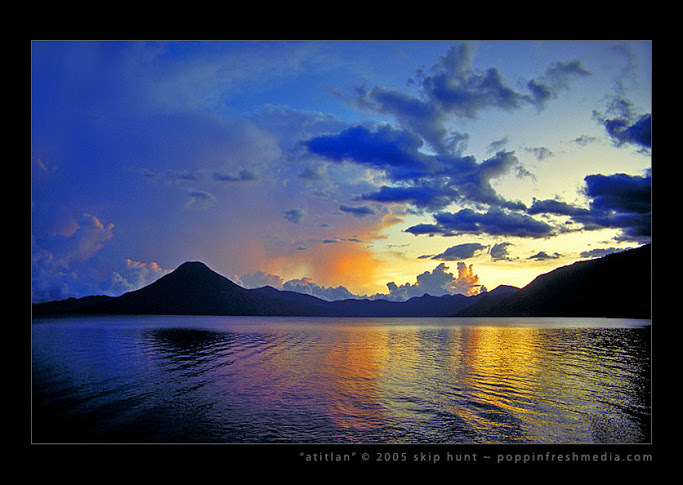 Lake Atitlan in all splendor guarded by her volcanos. The Lake is a blue that is only experienced not described. Finally, I pause for Guatemalan coffee at a beautiful hotel I have sworn to return to before I retire. I plunge off the mountain to land at my buddies compound on the shores of Lake Atitlan. Maria, the maid greets me with coffee and pastry and I settle into a few weeks in Atitlan. Next door to my buddies compound is a five star hotel with an incredible restaurant that serves Gallo (a local beer) and Black Angus steaks. I sit at the restaurant’s bar alone on this sultry summer evening looking down to the terraced pools that lead ones eyes to the beach and lake and volcanoes. The restaurant has pillars cascading half moon down to the pool and the entrance and bar give a perfect view. I had a coat, shirt and tie tailored in town the day before and sat smoking a good Cuban cigar looking out over peace. I notice that at each pillar well dressed men have materialized and here I am the lone gringo at the bar! Two well dressed men sit down on either side of me and I notice a bulge in their jackets. People begin to rise and clap and I look to the entrance. 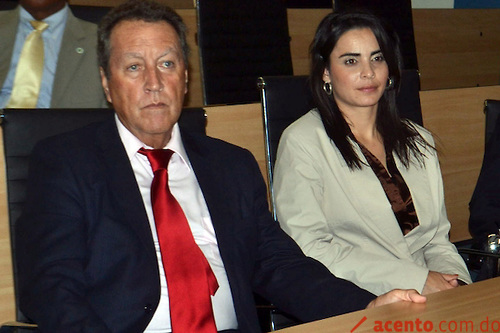 A well dressed man in his mid-forties accompanied by a stunning woman and a young boy walks in and smiles, hold the chair for his wife as she is seated. Marco Vinicio CerezoArévalo the president of Guatemala – the first civilian president in fifteen years. I had no idea who he was! I just knew that two armed gentleman are sitting on either side of me and so I bought them both a beer! They were both gracious and curious. They asked me many questions and looked at my passport. They were very polite and curious not interrogative. They asked me if I would like to meet the President of Guatemala (they assumed I knew) and I was thrilled. No one left until the president left and then only slowly. The two security men told me to come to the fourth floor in a half hour. I tried to pay my bill but the tab had been covered and I took the elevator to the fourth floor. Marco Vinicio Cerezo Arévaloelevator to the fourth floor. Guns and security bristled in the hall as I was escorted in to meet Marco Vinicio Cerezo Arévalo. I shook his hand and stuttered a sincere thanks and love of his country. He was gracious as the smell of cigar smoke lingered it was a moment locked in the eternity of my mind. Previous postHappy Earth Day / Prius vs 69 Jeep CJ5! Next postPinon High School 1999 – gun – what would you do? Nice read. Must have been very exciting? Will ther be more? Hope all is well. Thanks Bobby – nothing could be more exciting than meeting a great man! Well, buying one of your tents would rate a close second! More to come! thats pretty cool….to have met someone like that. very good real. love the photos. Thanks Cass – my best adventure was Page and my maternity ward classroom! What a fascinating life you have led. Your story was beautifully written, and absolutely transported me to Guatemala…You have a gift for writing my friend. and you have a gift for inspiring me to carry on writing! Thanks you so much for the compliment! Awww…lived here 2008-2010. I cannot imagine what it was like there in 1989. I am jealous. It is one of the most beautiful and inspiring countries I have ever visited. I ache right now thinking that I probably will never live there, again. Thank you for sharing this story and conjuring memories that I hold dearly. Funny how we both have been ex-pats and Guatemala and that little third world called Pinon! love and miss ya! Neat! Crazy when stuff like that happens. We bump into royalty and don’t even know it. I’ve never been to central or south America. Well… Mexico, but that hardly counts. I really really REALLY want to go. You just made me want it more. I agree with the others, great description. I was there. GO! It is an amazing place – and much safer today – I have good friends in Guatemala and Costa Rica that would welcome you! I will! I have a three-quarters full passport to finish filling up before it expires next year!